Okay, how could you not think of Sir Mix-A-Lot's 'Baby Got Back' when you hear about this topic? At least, I couldn't. In a news release from Oregon State University this month, an international team of scientists (including faculty from OSU's College of Earth, Ocean, and Atmospheric Sciences) have taken a look at the amount of friction generated in the 2011 Tohoku Earthquake. Why? To take a measure of how 'slippery' the fault is. This was done in a groundbreaking and unique way- by drilling through 800 meters of the seafloor to place specialized temperature data loggers in the fault area. Scientists can translate measures of heat into friction- think of rubbing your hands together quickly; the friction, or action of two surfaces moving against one another- create heat. The same is true for the earth's tectonic plates rubbing against one another, but on a much larger scale. More heat means more friction, or energy generated when the plates rub together. Less heat means the faults slide more easily past one another. Imagine this, on tectonic plate scale. Turns out, these plates (The large Pacific Plate and more regional Okhotsk plate, on which much of Japan rests) slide pretty easily by one another. This means that there is little resistance for subduction of the Pacific Plate under its neighbor. What does this mean? That it may take a lot less to generate plate movement, and therefore earthquakes, than previously thought. Oh, and to specify what 'little' resistance means in tectonic scale terms; The quake generated approximately 27 million joules in two minutes, which is a lot. 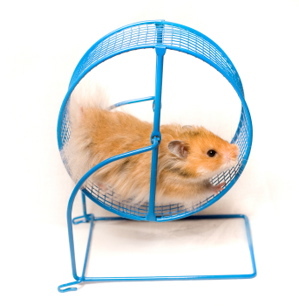 Just for comparison's sake, a hamster in a wheel can generate a mere ~60 J in two minutes' time; that is, it would take 720,000 hamsters running in wheels to generate that much energy. Check out OSU's article here, or keep an eye out in Science later this week for the peer-reviewed study, which I hope is called 'Baby got Back (Calculated)'.